Snow on the mountain above us is rather beautiful as seen from Otaki but it has made it cooler for sure. Time for pruning and garden clean up. Trying to keep veges from being eaten has meant that I have covered many with cloth bird netting, not sure if it a possum because all the broad beans were topped, so back to replanting seeds again. We have enjoyed guests over the past weeks, interesting conversations, baptisms in the river below the house on a sunny day at Easter, work on the dam track to improve drainage and genuinely glad we have a way to warm the house when it turned cold. After hearing how many days it has taken to get power to houses in Auckland area we know that would have been us if we had been connected to the electrical systems. Bees are getting ready for winter.. It sure is likely to be a cool one if it’s anything like the northern hemisphere with this cold snap one month early. I am glad to share honey this season.. as I didn’t get it tutin tested so giving it away. Work is being done to strengthen the river side of the road on the Otaki side with a washout protection being extended. This takes days with railway irons being pushed in by a digger and then the crew comes in to drill into the hillside and back fill with concrete. Otherwise the road has been good. 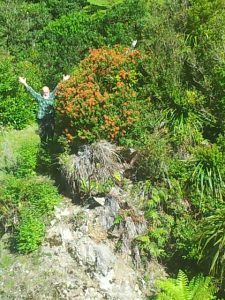 The photo was taken at the dam… the rata flowering there at this time of year was amazing. It is usually a climber so dfferent to see it as a tree close by and not eaten by goats or possums. The water in the dam fluctuates so on some visits there’s a waterfall and others not.